This wax statue of Winnie Madikizela-Mandela has been praised for its accurate depiction of Mama Winnie whose legacy looms large in the world. Lungelo Gumede, the artist behind the sculpture has received wide commendation for his work. While South African struggle icon Winnie Madikizela-Mandela received a worthy statue befitting of her legacy, Burkina Faso's former revolutionary leader Thomas Sankara whose statue was unveiled on the 2nd of March 2019. Many have argued Sankara's statue has no resemblance to the celebrated Burkinabé leader, asking if the infamous Rasta was involved. South African artist Lungelo Gumede created a wax statue of Winnie Madikizela-Mandela and Nelson Mandela. Gumede showed the statues on his social media pages and has garnered a lot of interest from inside and outside the continent. Lungelo, a world renowned artist, is on a mission to start the first ever wax museum in South Africa and Africa at large. The life-size statue took Lungelo and his team 10 weeks to create. Mama Winnie's statue has received more love and commendation as compared to the recently unveiled statue of Thomas Sankara. While Mama Winnie's statue is life-like and bears great similarity to her, embodying who she was and what she stood for. Thomas Sankara's statue which was recently unveiled in Burkina Faso has received wide-spread criticism, with many expressing their disappointment in the lack of finesse and resemblance to Sankara. In a poll conducted by This Is Africa, 70% of respondents supported the idea of having another African country erect a more befitting statue for Sankara. Sankara's statue was part of the Thomas Sankara Memorial monument which is supported by the Burkina Faso government. The statue has been described by some as insulting to the memory of Sankara, while some have suggested that the statue be redone. In September 2016, popular Zimbabwean sculptor Dominic Benhura made a statue of former president Robert Mugabe. The statue received a lot of flak on social media with the hashtag #MugabeSculpture trending. Many questioned if Benhura intended on mocking Mugabe. Benhura however defended himself and said, "I think most people do not understand my art and they do not understand the difference in art styles. That sculpture was never meant to look exactly as the President's image. I do not do exact figures. Some artists do exact figures, but I do something that makes my work different." While Benhura's statue of Mugabe remains memorable in the minds of Zimbabweans for different reasons, one other popular artist known for his works is Lebani Sirenje also known as Rasta, who honours celebrities by painting them during their funeral. On January 19, 2019 during the Actions National Congress (ANC) manifesto elections, he presented a painting of President Cyril Ramaphosa. Rasta's popularity however comes from the fact that people never see the semblance between his paintings and the subjects he paints. Rasta's painting of late Zimbabwean musician Oliver Mtukudzi went viral on social media. 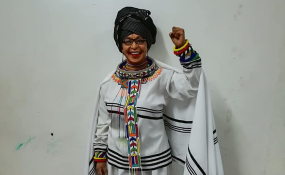 On the 5th of March 2019, the Economic Freedom Fighters' (EFF) motion in parliament to change the Cape Town Airport to Winnie Madikizela-Mandela was defeated by 224 votes against the EFF's 25. The death of Mama Winnie Madikizela-Mandela on the 2nd of April 2018 left the whole of South Africa in an emotional turmoil. She was a strong anti-apartheid activist who was put under house arrest for 491 days. But even in her death, attempts to reconstruct her legacy, mostly by the Western media, left many women on the continent angry. On her memorial service, the Economic Freedom Fighters leader Julius Malema dared the ANC government to rename the Cape Town Airport after Winnie Madikizela. Mama Winnie's statue couldn't have come at a better time.